Follow North Africa’s infamous Barbary Coast to Rabat, once a lair of the corsairs and now the country’s capital. Enjoy an orientation drive to see the massive medieval battlements, the Royal Palace, and more. Continue to Meknes. Originally founded as a military settlement it was transformed into an impressive city in Spanish-Moorish style during the reign of Sultan Moulay Ismaïl. During your guided sightseeing, admire the monumental gates of the city walls, the mosques, and the palace. Visit the ROYAL STABLES, constructed to house 12,000 of the royal horses. Next is Fez. Blessed with an ample supply of water and strategically situated, Fez became the capital of Morocco when the country shook off foreign rule under Berber King Idris in the 8th century. To this day, Fez has remained Morocco’s spiritual and artistic center. 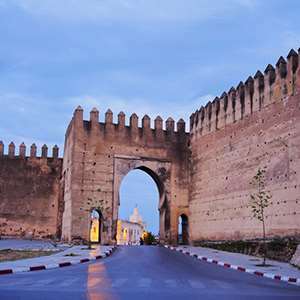 View the magnificent entrance to the Royal Palace, drive through the Mellah, the old Jewish quarter, and travel on to Bab Bou Jeloud, the traditional entrance to Old Fez. Your Local Guide also leads you through labyrinthine MEDINA and MEDERSA BOU INANIA. Tonight, an optional folklore dinner completes a fascinating day. 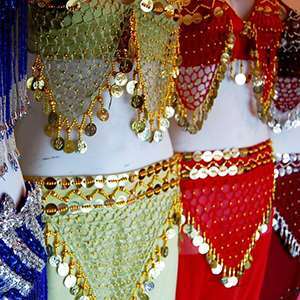 Return to Casablanca and join your Local Guide, on a panoramic drive, featuring a visit to the HASSAN II MOSQUE, a splendid monument designed to mark the end of the century. 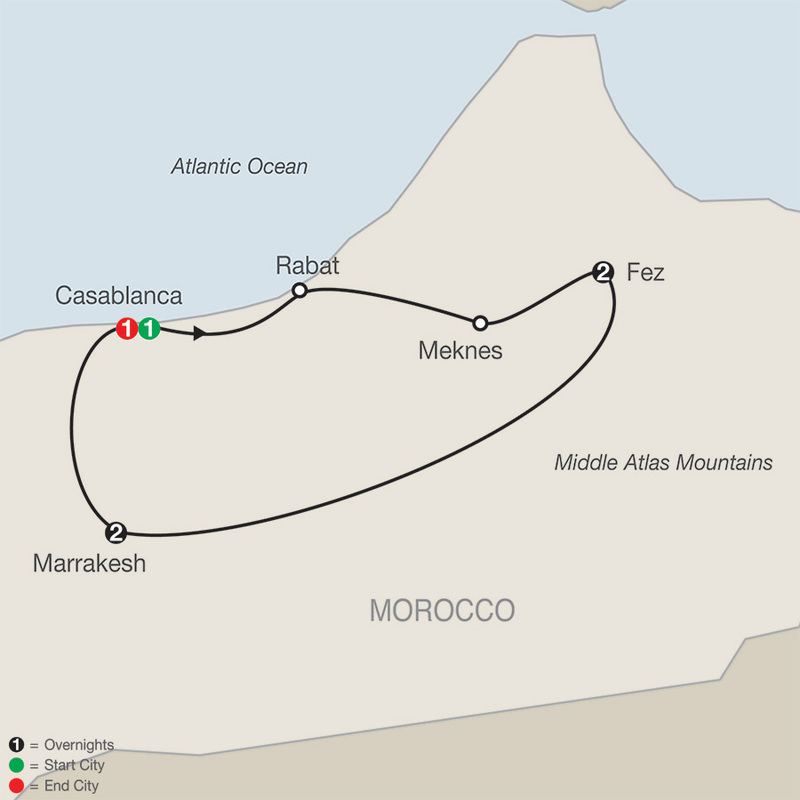 This evening, a farewell dinner at one of Casablanca’s lively restaurants celebrates your Moroccan Escape..
Head into Morocco's Middle Atlas mountain region for an exciting encounter with real Berber culture as you visit a family in their Bhalil village cave home and then explore the medina in pretty Sefrou.